Rigby needs your help! You must do everything to explore this territory and save his friend. Is everything clear? Well, just launch him and try to stay alive as long as possible. Be ready for many unexpected surprises and enjoy the game. We are looking for the guy, who is not afraid of any obstacle and who is always ready to help Rigby, cause he has lost his friend! When he tries to start the game, he gets absorbed in it and the only way out is to win the game. 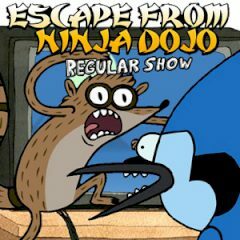 You must rescue Rigby from ninja’s prison an help him get trough all the obstacles. Discover different types of walls and surfaces which should seize to help Rigby escape alive and you will love this game. Use the mouse to launch him and avoid any obstacle here. Just have faith in yourself and good luck to you!